World-class cocktails, small bites, and fondue, perhaps the world’s ultimate comfort food. A festive evening in the Vista might include music, good company, and – martinis and fondue? What? Unlikely pairings and creative combinations cornerstone the menu at one of Columbia’s newest dining scenes, City Bar Martinis & Fondue on Gervais Street. Shmanske and his gifted chef James Jones strongly agree on the Southern flavor in their cuisine. Grits occupy a prominent spot beside braised short ribs, roasted in, of all things, fresh citrus juices. Where a biscuit is called for, it’s a sweet potato biscuit, toasted, as part of a classic Cajun recipe. And collards show up to accompany grilled pork chops. for a Lowcountry slant on down-home style. But don’t mistake City Bar’s menu for what you grew up on at Grandma’s table. Shmanske researched customs in this country and Europe for the ultimate pleasurable dining-out experience. He hit upon fondue as his signal offering, an item not found at most other restaurants, and one that lends itself to variety and a table-top involvement. Plenty of local and imported cheeses to flavor the occasion. He even came up with a pimiento-cheese fondue dip (there’s that Southern accent again). To top off the experience, chocolate fondue with strawberries dipped in. He found restaurant and bar work as many do, holding down jobs as bartender and waiter while a student in Myrtle Beach, and later in Columbia where he earned a degree in chemical marine science at the University of South Carolina. He feels lucky to have obtained James Jones for the chef position at City Bar. Jones grew up in a family with a tradition of fine cooking; learning beside his father and grandfather, he was on the team which took first place five times at Columbia’s Barbecue Cookoff. Seguing into a career of fine cookery was a natural progression for him, and he earned credentials at Johnson and Wales Cuisine when it was located in Charleston, and B.A. degree at the University of South Carolina. Like his employer, Chef Jones is open to experimentation. He says he looks at cooking as a blank canvas, waiting for something different to be created. And the Southern touch allows for the ultimate comfort food, to be enjoyed and savored. “I’m not scared to try putting things together in unusual combinations. How else are you going to find out what works and what doesn’t?” he says. Like other top professionals, he emphasizes fresh, and whenever possible, local products. No frozen prepared short cuts in his kitchen; it’s 95 percent hand-prepared on-site. No one knows better than these two seasoned veterans that the restaurant career is a demanding one. Shmanske is proud of the 100-plus employees on his roster, where he requires a high level of professionalism so that diners have an enjoyable experience. He says table service is an interactive moment, and anyone who tackles it must want to assist in providing a social and pleasurable time. He likes the idea of career women coming to City Bar for their night-out excursion, and upscale Midlands diners finding this new spot for experimentation. The entrepreneur has received praise for his creative work restoring and adapting old buildings in Columbia. City Bar is his fifth foray into the Columbia restaurant scene. The first four (The Thirsty Parrot, Latitude 22, Burger Tavern, and the Moosehead Saloon) function in the lively Five Points arena, and he holds an award from the Five Points Association for the refurbishing of the old Sharkey’s building. 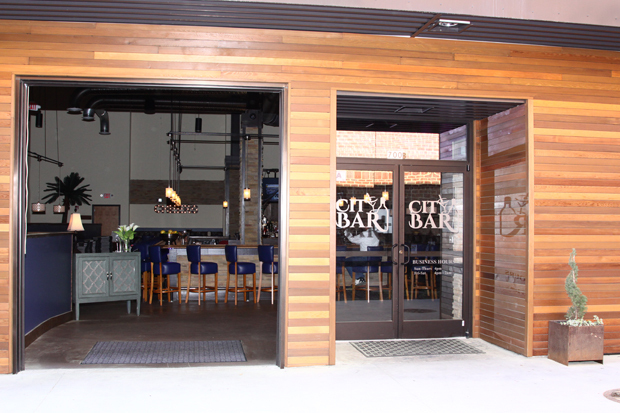 City Bar’s building is spacious and attractive with an historic flavor. Its unique alley-style location provides intimate sidewalk dining as well as open-access walls. The original Ben Arnold would be proud of his warehouse renaissance. City Bar is still settling into its niche, with signage and Web page and more off-beat ideas on the way. An innovative offering is the all-day Sunday brunch; 11 a.m. to 9 p.m. on Sunday, a mouth-watering menu featuring blackberry grits, French toast casserole, Red Velvet pancakes, praline bacon: what’s not to hunger for? Matt Shmanske was married last December 31 to Tasha, who assists with the restaurants and clubs. They held their New Year’s Eve reception at the State Museum, just a couple of blocks away from 700 Gervais Street. And ever-energetic Matt admits to being in negotiation with Ben Arnold for another Vista enterprise. Don’t expect any of the same-old-same-old; just open up your taste buds and wait for another surprising twist on southern traditions.